The dream season for Port Washington reached its climax on Wednesday afternoon, as the Vikings defeated Ward Melville 5-2 in the Long Island Championship at Half Hollow Hills West High School. The final began last Wednesday but rain suspended play and forced it to be finished this week. The first doubles tandem of Brittany Polevikov and Sofia Walzer defeated Julia Hu and Ella Anderes 6-0, 6-0 in the only match to finish up before rain stopped play last week, and thus Port Washington entered Wednesday already holding a 1-0 lead. “It was nice to have a win under our belt and come here and cheer on the girls,” said Polevikov. 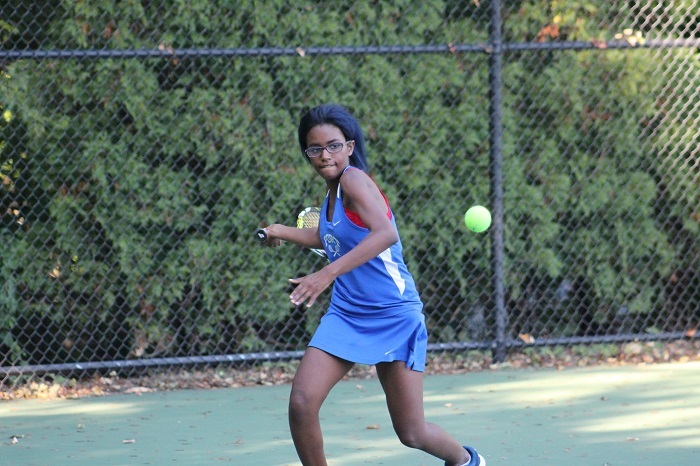 The McGowan sisters, eighth-grader Martine and Tiffany, a senior, quickly added to the Port Washington lead with their wins at second and third singles, respectively. Port Washington senior Tiffany McGowan won her match in straight sets to help lead the Vikings to the Long Island title. 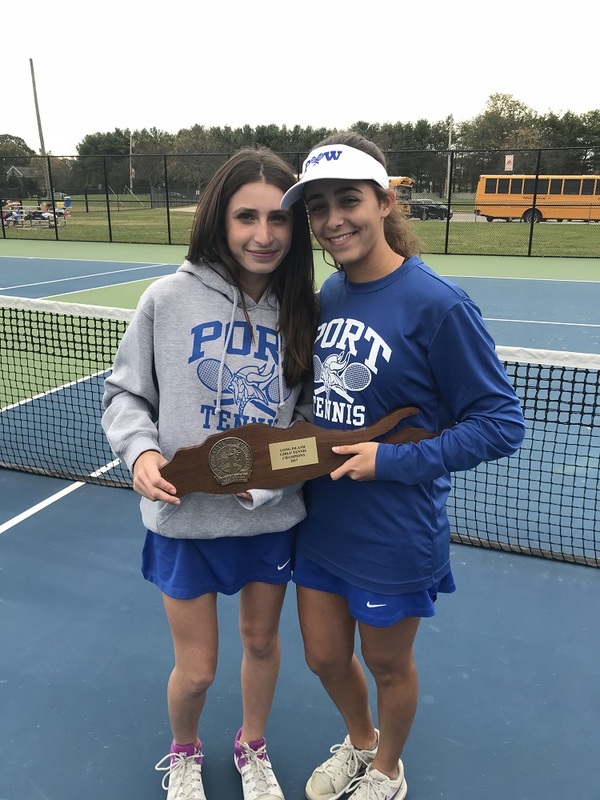 The clinching match for Port Washington, just like in the Nassau County Championship, came on the third doubles court, as Mia Froccaro and Kelsey Sy knocked off Ellie Berger and Sam Sloan 6-0, 6-1 to seal Port Washington’s first Long Island title since 2008. Port Washington’s fifth victory came at second doubles as Casey Fanous and Charlotte Forman won 7-6(6), 6-2 over Ward Melville’s Dara Berman and Leah Sugrue. Ward Melville got wins from first and fourth singles. Anna Ma beat Ada Amarghioalei 7-5, 6-3 at fourth singles while Denise Lai outlasted Thea Rabman 6-3, 4-6, 6-3. 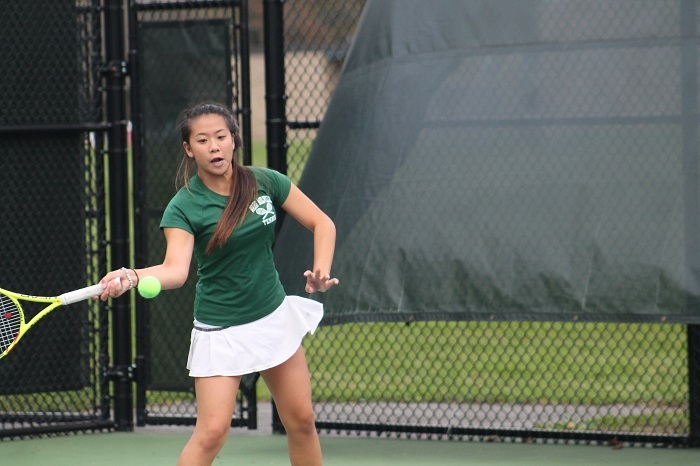 Anna Ma won her match at fourth singles for Ward Melville. 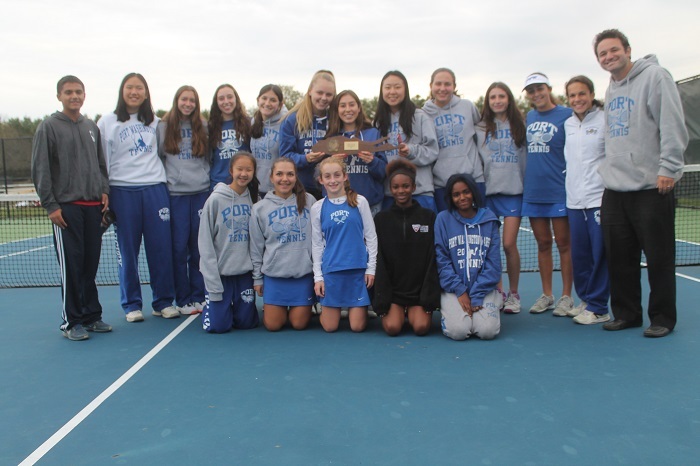 The Long Island Championship was the 17th straight win for Port Washington as they won every match since losing its season opener to Great Neck North. Port Washington proved to be the best team on Long Island this season and that could be the case again next year, with players like Thea Rabman and Martine McGowan at the top of the lineup and loads of depth throughout the roster, this season could be the beginning of a long run for the Vikings.